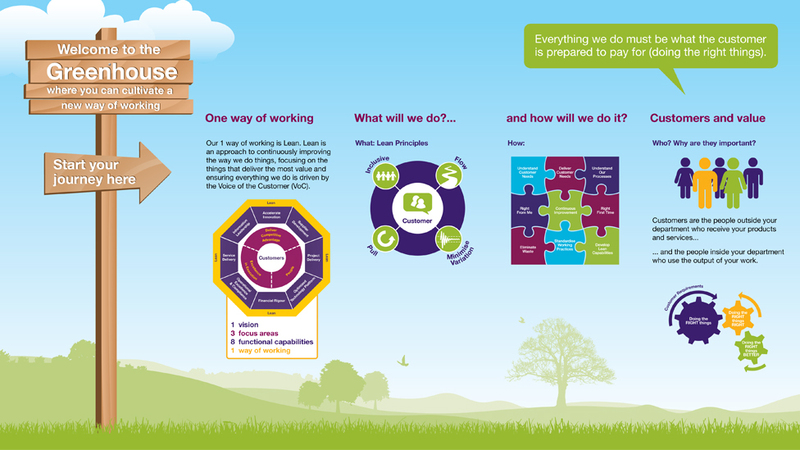 When AstraZeneca’s IS department asked us to design a modular training pod to demonstrate their ‘Lean Tools’, it was a challenge we couldn’t resist. 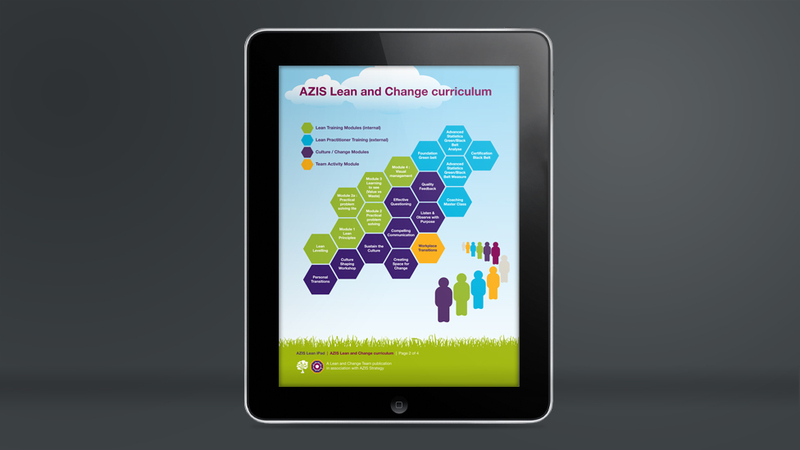 The brief was to create an interactive Lean Tools training zone in which users could become totally immersed within the principles and thinking of the Lean manufacturing programme, and where the impact of external distractions was limited. The solution also needed to be portable and provide a workspace where small groups could experiment with Lean Tools and techniques together to solve problems and develop more efficient ways of working. Combining our expertise in exhibition design and internal communications, we came up with a variety of solutions which would successfully fit the criteria. We ultimately proposed a virtual room constructed of several modular pop-up exhibition displays and interlinking internal and external wall graphics. Affectionately nicknamed the ‘Lean Greenhouse’, we developed a theme which revolved around the concept of growth and cultivating a new way of working. The Greenhouse even has its very own Lean tool shed, featuring tools and techniques used within the Lean manufacturing programme. The graphic panels are gloss-laminated allowing them to be used as an interactive wall with dry-wipe markers for ‘hands-on’ group activities. 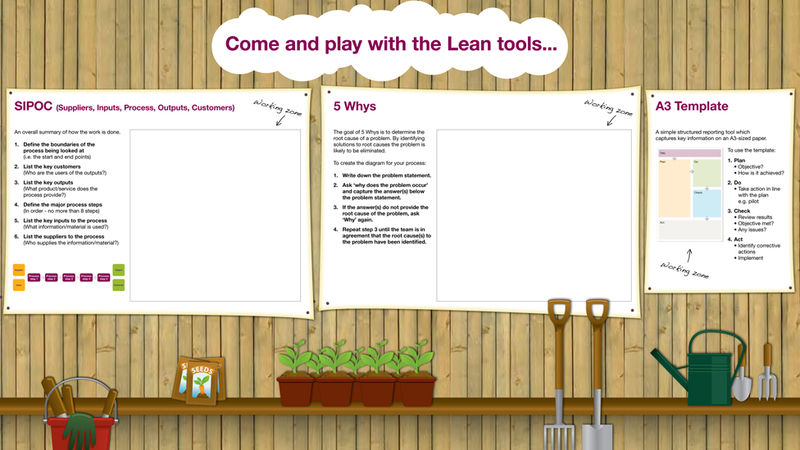 To enhance the whole experience, the Lean Tool shed included two iPads on which we developed several multimedia applications including video, interactive PDFs and instructions for the Lean Manufacturing curriculum. These interactive Lean Tools also provide an innovative yet simple way for individuals and teams to record the results of their activities by taking a photo and emailing the visual back to their desk directly from the iPads. 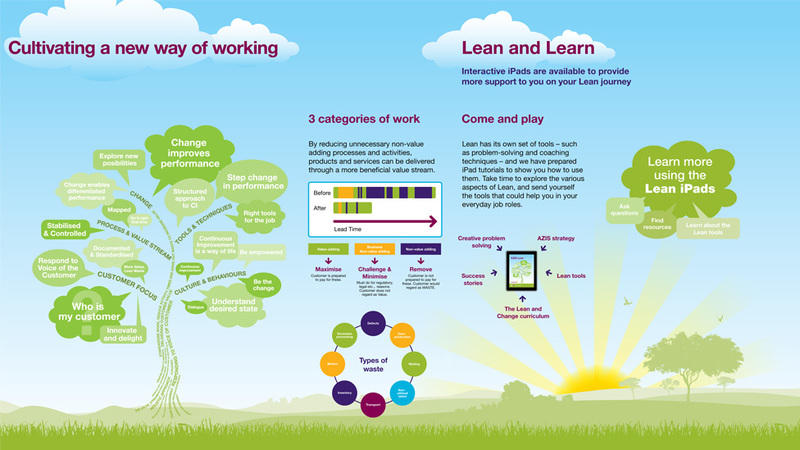 This allows the learning and experiences gained inside to live beyond their time in the interactive Lean learning zone, encouraging employees to implement the processes and results within their day-to-day roles. The solution delivered just the flexibility the client required – a freestanding, self contained modular training pod which could be simply erected by one person in less than an hour, and easily transported for different events, in the UK or overseas.